John Paul Stevens was appointed by President Gerald R. Ford in 1975 as Associate Justice of the U.S. Supreme Court. Stevens previously served on the U.S. Court of Appeals for the Seventh Circuit. He retired from the Supreme Court in 2010. 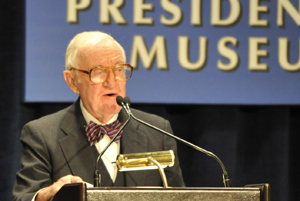 John Paul Stevens was interviewed for the Gerald R. Ford Oral History Project on October 2, 2008 by Richard Norton Smith. Smith: First of all, I want to talk a little bit your life before your path ever crossed with Gerald Ford. It’s been extraordinarily colorful, eventful life. At the age of seven you met Amelia Earhart and Charles Lindbergh, about the same time? Stevens: It was about the same time – a little later. Amelia Earhart was at the banquet of the opening of the Stevens Hotel. She was the principle speaker there. It was a weeknight and my folks took me to that event and introduced me to her after her talk. Her comment was, “You’re out awfully late on a school night, young man.” It was probably 7:30 – I don’t know. Smith: You got a gift from Charles Lindbergh? Stevens: Well, yes. I remember my dad taking me to the room during his tour of the country after he came back from Paris. He took me up to his room in the Stevens Hotel. The room – a suite – was just filled with gifts of one kind or another. He showed us this dove in a cage and I remember him saying to me, “What do I do with this?” I don’t know what the conversation was, but he ended up giving it to us. So we took it up to Michigan where my dad had a summer home and, unfortunately, it found its freedom up there. It only stayed with us for a couple of weeks. Smith: You also, at a very young age – went to the 1932 Democratic convention. Stevens: I don’t know just what he did, but even though my dad was a Republican, somehow or the other he had friends who gave him a couple of tickets to the afternoon session, as I remember it, when Franklin Roosevelt accepted the nomination. I just remember being there, of course. I can’t remember much of what was being said, but the memory does stay with me. Smith: Finally, you were also connected with Babe Ruth at Wrigley Field. Stevens: I was one of several million people who claimed to be in the stands that day, but I actually was and he did indeed, point at the center field bleachers before he hit the ball out of the park in that event. Smith: Your World War II experiences. It is interesting, obviously your part of a whole generation – Gerald Ford’s generation – and a number of people who have written about your career in the court suggest that it not only shaped your life, but in some ways, shaped your approach to the law. Do you think there is anything to that? Stevens: I think I was dead right in that case. I really think that there are people today who do not appreciate and understand the power that the symbol of the flag really can carry and did carry. It really was a symbol of a lot that’s very wonderful about our country. I think that every now and then there is sort of a – you get over-enthusiastic about the value of the first amendment – but prohibiting flag burning really didn’t prevent anybody from communicating any idea they wanted to communicate. I think that – and I’m not suggesting that we should change the law. It’s part of our law now, that’s well settled – but I think the only real significance and tangible events of the decisions was, nobody burns flags anymore. Smith: It’s also been suggested, for example, that since you were awarded for your work as a cryptographer, perhaps your attitude about the death penalty has something to do with Admiral Yamamoto being targeted as he was. Stevens: Well, in a very remote way, it does because I do remember the occasion very well. I was on duty when we got word that the operation had been successful. And the difference between having some unnamed person in some other location lose his life or be killed is quite different from the reaction you have to a particular individual who is singled out for that treatment. It is something I’ve often thought about. As I understand it, I think the decision to carry out the operation was only made after getting the approval of the president, of Franklin Roosevelt. Smith: You had not originally intended to go into the law. Smith: What did you envision after the war – what your career path might be? Stevens: Well, my original expectation was to try and teach English. There was a lot of vacillation back and forth. But two or three things influenced me during the war, and one of the things was the GI Bill, very frankly. Being able to afford it. One of my older brothers, who was already a lawyer, was very influential in my decision. Smith: Obviously, it was the right decision. You scored the highest gpa in the history of the law school. Stevens: Well, I’ve been told that – as of that time in Northwestern Law School. I’ve been told that that was true at the time. I can’t verify it, though. Smith: Then was that followed by your clerkship with Justice Rutledge? Stevens: Yeah. I was down here for a year working for him. Smith: It’s funny, I was trying to put myself in Gerald Ford’s shoes when he saw he had a vacancy in the court – you really have had a remarkably varied career, in the sense that you were in private practice, but you also had some Capitol Hill experience. Stevens: Yes, I did and really, that was terribly important to me. I was the associate counsel appointed by the senior Republican, Chauncy Reed, on the sub-committee to study monopoly power of the Judiciary Committee of the House of Representatives. A long title. But actually, I was sort of co-counsel because the work was not of a very partisan nature, as it developed, although some of the preliminaries thought it might be. But we had some very interesting investigations, one of which was of organized baseball. I learned a lot about baseball during that tenure. And I met people like Branch Rickey, Ty Cobb, Mickey Mantle, Ford Frick, and that helped maintain my interest in the game. Smith: I’m curious – I have to wonder – this is the early 1950’s, I think 1951 actually. At that point Gerald Ford was a young Congressman. Do ever remember whether your paths ever crossed? Stevens: No, I’m quite sure they never did cross until shortly before I was appointed. Smith: Then you came back to Chicago, you formed your own law firm. Smith: You taught and wrote very extensively, especially on anti-trust matters. You were a litigator, and then, were at least on the periphery Illinois politics with the Greenburg Commission. What was the Greenburg Commission? Stevens: There was a gentleman by the name of Sherman Skolnick who had some kind of – today it would on the internet of some kind – but he communicated with the press and with people generally complaining about the integrity of the judiciary in all sorts of ways. And he brought litigation against the city of Chicago – against all sorts of defendants. And every now and then he came up with something that made a lot of sense. Most of what he did was regarded as irresponsible and off the reservation, and so forth. But he suspected that some members of the Illinois Supreme Court had improperly received some benefits from Ted Isaacs, who was the Director of Revenue of Illinois and who was indicted on a conflict of interest charge. Eventually he was exonerated by the Illinois Supreme Court, and there was a suspicion that his relationship with two or three members of the court might have affected the case. And so, although most of Skolnick’s charges were often thought to be unfounded and so forth, there was enough smoke here so that the Illinois Supreme Court appointed the president of the Chicago Bar Association and the president of the Illinois Bar Association, Henry Pitts – the Pitts-Greenburg Commission. They were to form a commission to investigate the integrity of the judgment in the Isaacs case. They asked me to serve as General Counsel of the investigation, which I agreed to do in a brief telephone call, and found myself involved in a very interesting and difficult public inquiry for a matter of several weeks. Smith: The outcome of that was? Stevens: Well, the outcome of that was that we wrote a report which concluded that they had been guilty of an appearance of impropriety because one of two justices had been given an opportunity to buy stock in a bank that Isaacs had formed at a bargain rate, and the other one had received shares in the bank as what was described to be a campaign contribution, but then it turned out to be a gift to his grandchildren. There were equivocal facts there, but the net result was that they decided to resign after we published our report. We had public hearings – it was kind of a long story. Stevens: Well, I guess that’s true. Yes. Smith: – long before you came to the Court. The popular notion of this as a cloister of people who move from one hushed chamber to a higher hushed chamber is not borne out in your case. Stevens: No, I was fortunate to have a very diverse private practice. Our firm was diverse, we had a Catholic, a Jew and a Protestant. We had a Northsider, a Westsider and a Southsider, and we represented plaintiffs and defendants. We had small matters and we had important matters that we worked on. Smith: Then in 1970 President Nixon appointed you to the Seventh Circuit. I don’t know how to ask you this – in Rome there are what are called papabili – potential popes – and I think in the latter stages of the pontificate they all know who they are, or who they think they are. I’m not asking about you in particular, but is there a similar phenomenon on the bench? Where there are judges who, accurately or not, I’m not saying they’re campaigning for the court – but or perceive themselves as potential justices? Stevens: Well, I don’t know, but my appointment really came out of the blue. Senator Percy, at that time, I’m not as familiar with what the process is today as compared to what was then, but, in 1970 the Senator pretty much controlled the appointment – judges are appointed with the advise and consent of the Senate – and that basically means that the Senator is given the right to veto – and at that time the Illinois Senator could veto the President’s appointment of the senator. So it was Senator Percy who was making judicial appointments in Illinois, and that, of course included the vacancy on the court of appeals. I had known Senator Percy in college – we were classmates in college. I hadn’t seen him for a good many years, but one day he called me up – sort of out of the blue – and said he wanted to have a visit with me and could I meet him? I met him at the Ambassador Hotel on a Saturday or Sunday, I think, and he said he wanted to get my advice about the vacancies and we talked about some people and then he asked me whether I’d be interested. That’s the first suggestion that came up. I told him, I thought probably not because I had couple of rather important pieces of litigation that were very much alive then and my practice was just getting to the point where it was important to practice law rather than do something else. Anyway, our conversation developed into his suggestion that he would appoint me if I would accept the job. I thought it over and decided to accept it. Smith: And then, of course, five years later comes the call. First of all, did you know Justice Douglas – did you have any kind of relationship with him? Stevens: Well, yes and no. I had met him when I was a law clerk and he had a reputation as friendly Bill Douglas, and I guess he was very much liked by a large number of people, but among the law clerks he was regarded as a rather stern taskmaster, generally. As I said, I had met him and spoken to him, but I can’t say that we had a friendly relationship, by any means. And then I did meet him after I was appointed. He retained his chambers and I spent some time talking to him then. But that’s about the extent of our connection. Smith: There is story about one of the Douglas law clerks who was fired for going away on his honeymoon – I think he went for a weekend honeymoon. And then supposedly there was a corner of the law clerks’ library that was set aside for all of Justice Douglas’ fired clerks who were waiting to be rehired when the Justice’s mood lightened. Stevens: I hadn’t heard that story but it is consistent with the stories that I have heard. Smith: How was the first approach made with you that led eventually to your appointment? First, tell us about Ed Levi. Stevens: Well, he was a contemporary of one of my older brothers and I had known him – just known him. I wouldn’t say we were close friends or anything of that nature – but when I was in practice, on two or three different occasions he had sent me business and for people who had called him and asked for recommendations and he had suggested my name and I got some very interesting work as a result of that. So we had contacts. And then shortly after we started our firm, he asked me take his anti-trust course at the University of Chicago Law School on a temporary basis because he had assumed additional responsibilities as Dean of the Law School. So I did that and I taught a course in competition and monopoly with Aaron Director, who was a very fine economist. I probably learned more in that course than in most of the courses I had during law school. Then he asked me also to teach another course in patents and anti-trust at the law school. I had seen him in professional occasions, and so forth and I would regard him definitely as a friend, but I was always a great fan of his. He had a great reputation as a scholar and everybody admired him. But we were not – we didn’t go out to lunch every day or anything like that. Smith: Was he the person who recommended your name to President Ford? Stevens: I think so. I know he participated in the process and I think also that he arranged the occasion when I first met President Ford and that was I think during the few days after Douglas resigned. They had a dinner at the White House, at which they invited the chief federal judges from all the different circuits and several judges in Washington and a few other judges – it just seemed to be sort of a spontaneous entertainment of federal judges at the White House. But there were several people there, some of whom I then knew and have since learned were under consideration to fill the vacancy. It was at that dinner that I first met President Ford. Smith: Was Justice Douglas attending? Stevens: No, I’m quite sure he was not. But some members of the court were, and I just don’t remember for sure which ones were there – I think probably Potter Stewart was there, but I really don’t remember just exactly who all was there. Smith: Did you have any other rivals – for lack of a better word – on the Seventh Circuit? Were there other judges being considered? Stevens: Yes, my very good friend Phil Tone. He was a very fine judge and he clerked for Wiley Rutledge the year after I did. He was reading the newspapers, reading the Tribune when we learned that we were among the group that was being considered. Have I told you the story about our conversation about this? I did mention it in Grand Rapids, I think. But in any event, we met one afternoon, we were talking about the problems. It’s kind of a distraction from your regular work when you know that the lightning might strike. We had agreed that if either of us heard anything from Washington, we’d tell the other one, so we would know what happened. When President Ford called me, he asked me – he said he wanted to be sure I’d accept the nomination, which of course, I was honored and delighted to do. He called me in the morning – it was the day after Thanksgiving, I think, and at the end of our conversation he said, “We’re not going to announce this until late this afternoon, so I would like you not to tell anybody until then.” I said, “Well, Mr. President, it puts me in an awkward position.” I explained our agreement, and of course he knew about Judge Tone. He said, “Well, I’m sure if you explained…” and I said, “I would like to tell him,” and he said, “Well, I’m sure if you explain later why you didn’t do it, he’ll understand.” And so I did not talk to Judge Tone, but at about 4:30 in the afternoon, if I remember correctly, maybe 4:30 eastern time, I got a call from somebody in the White House. I don’t know for sure who it was. I think it may have been Phil Buchen in retrospect. He said that the President asked him to call me to tell me I could tell Judge Tone now. Which I thought kind of shows you what kind of a person the president was to be that thoughtful about a personal relationship. So I hung up the phone and I got up to go to see Phil and he walked in my door. He’d already heard the rumor. So the whole thing didn’t matter. But I remember that very well because I thought it gives you an insight about the kind of man that President Ford was. Smith: Now in between those two events I assume you met with the President for a job interview? Stevens: Only at the dinner that I described. Stevens: And I did not meet, and I had no conversation whatsoever with Ed Levi or anybody else in the White House. Smith: No one talked to you about your judicial philosophy? Stevens: He read a good many of my opinions. I don’t think he was quite as mediocre a man as people described him. He was really a very knowledgeable and intelligent senator. I had some conversations with him. He read my opinions. The judgment, as far as I can tell was made basically on the record that I had made in my opinions on the court of appeals. Smith: That’s extraordinary – in light of how the process has evolved – some would say degenerated – or certainly been politicized since. First of all, you were confirmed 98-0. Stevens: I was confirmed fairly promptly, yeah. Smith: Yeah, by a vote 98-0. Were you the last justice to be confirmed unanimously? Stevens: No, I think – I’m not positive – I think Stephen Breyer was confirmed – I think it may have been 100-0. Mine was only 98-0. Smith: It seems like a turning point in the process. Obviously I don’t want to cast aspersions on your successors, but that a president would choose a justice with so little seeming regard for politics/ideology – as opposed to sheer judicial excellence – however that’s defined. Stevens: Well, I’ve been told that part of the president’s motivation was to pick someone who would not be too controversial, because he was still in the process of getting the country back on track after Watergate. So I think that it was not totally apolitical in that sense. I think he thought about other factors. Smith: Did anyone, at that time, ask your opinion on abortion, for example? Stevens: No, and it is interesting. I’d like to just tell you – you might be interested in one side of it. That was not a controversial issue at the time – at least in terms of the nomination process. Nobody asked a question about it at the hearings. There was no discussion about it generally in the press, or anything. The big question was the death penalty, which was very controversial and the Court had decided Furman only two or three years earlier and held that the penalty – the then existing statutes unconstitutional – but that’s about the time that Justice Thomas was in law school, if I’m not mistaken. When he went through the process, a lot of people did not believe that he was not engaged in bull sessions about Roe against Wade over and over again. But in fact, at that time, it had not yet become the kind of controversial issue that it has since become. See, because the decision was 7-2 and was regarded as the substantive due process decision that kind of fell in line with the earlier decision in Griswold and it didn’t become the debatable question that it has since. Smith: By the way, in my notes, I noticed Barry Goldwater urged Ford to appoint Robert Bork to the Court and Mrs. Ford wanted him to choose a woman. Stevens: Yes, I think that’s right. I think the thing that worked against Bob Bork was the fact that he had done what the job required him to do during the Saturday Night Massacre – and he would have been a fine appointment – no doubt about it. Smith: Ford himself wrote later – in terms of explaining your appointment, “I endorse his Constitutional views on the secular character of the establishment clause and the free exercise clause, while securing procedural safeguards in criminal cases and on the Constitution’s broad grant of regulatory authority to Congress.” And I know from conversations I had with him, he took – to the end of his life – great pride in your selection. Stevens: That’s good to hear. Smith: He was very proud of that appointment. Stevens: Well, I’m proud to have been appointed by him, I can assure you. Smith: There must have been stories around this place about the not-so-old days, when presidents had continuing relationships with members of this court. I mean, people like Abe Fortas and Lyndon Johnson and even, I guess, Frankfurter and Roosevelt and all that. Presumably that was a thing of the past by the time you got there. Stevens: As far as I know. I’ve heard the same stories that others have – but can’t either confirm nor deny. Stevens: That’s exactly right – I didn’t know I’d acknowledged that publicly, but it’s certainly a thought that went through my mind many, many times. I never had the guts to ask him. I think he would have had the sense to turn me down, too. Smith: When did you take up piloting? Stevens: I think in the 1960’s somewhere – when I was in my forties. I had a place, at that time, in southern Michigan, in Lakeside in Berrien County and I planned to learn to fly so I could fly to Meigs Field and back during the summer, when I had my family in Michigan. I was then able to get a small plane and go back and forth that way. Smith: It’s customary in this town to put a label on people. At the time of your appointment you were described by many as a moderate-conservative. I’m not sure what that means – then or now – but you’ve said more recently that you still think of yourself, in many ways, as a judicial conservative. Stevens: Well, I believe the law is the law and a judge’s duty is to follow the law. And I really think that is what I do, and I think some of my colleagues are less conservative than I am. It’s not a matter of whether the case involves a political outcome that liberals or conservatives favor – that’s not what the law is all about. My good friend, Bill Bauer, was former chief judge on the Seventh Circuit and he showed me an article when I was in Chicago a couple of weeks ago that somebody had written about the fact that he described me as the only conservative on the court. Stevens: Yeah. It was a case or cases about decisions involving the SEC and securities matters. Smith: One reason why maybe people called you a moderate-conservative, I think you’d been quoted as saying that you had a judicial hero. Obviously you greatly admired Justice Rutledge – but you mentioned Potter Stewart’s name as someone you greatly admired. Stevens: That’s absolutely true. In fact, when I came down to the court, the papers sometimes described me as never having been reversed by the court of appeals – remember by the Supreme Court, in the opinions I’d written on the court of appeals. In a technical sense that was true, but there were several cases in which I’d taken a position that the court later disagreed with. And so, in a sense, I was wrong. But the Supreme Court decides what was right. But in all the cases on which I had written and which the Supreme Court also wrote later, I’d always agreed with Potter Stewart. I don’t argue with him, or he agreed with me. But it struck me when I came down here that he was the one who seemed most often to coincide with my own. And I still have extraordinary admiration for him. Of course the death penalty jurisprudence is always very controversial, but my views are pretty much, just almost identical with his on that whole issue. Smith: What are the qualities that make a ‘judge’s judge’? If Potter Stewart is an example? Stevens: I don’t know. It is just to try to do the best you can with the rules that are out there and not trying to decide everything yourself – but trying to recognize that there are a lot of other decision makers in society that have to be respected. Smith: Let’s go back to the ’99 visit when you came to Grand Rapids. I remember asking President Ford – I think that morning I said, “Now when was the last time you talked with the Justice?” And he said, “When I appointed him.” Did you have contact at all in between those years? Stevens: Well, it’s not quite accurate, because I did go to one or two White House dinners – and you have a very brief chance to talk with the President. I don’t remember any specifically, but I think we had that kind of contact. But it was always very brief. Smith: Then in 1999, you were good enough to come to Grand Rapids. Correct me if I’m wrong, I’d heard through the grapevine that you’d always wanted to play golf with the man who appointed you. How did that come to pass? Stevens: Well, there is a bankruptcy judge in Grand Rapids named Jim Gregg, whom I’d gotten to know and become friends with through the Sixth Circuit judicial conferences, and he is an avid golfer. Somehow or other he made the arrangement, I don’t know the details, but when he suggested it to me, I was delighted with the idea and the President was willing to do it and we did share a golf cart for a round of golf. It was one of the best days of my life. He was a very, very delightful companion, and that was a very special day. But I wish we would have been doing that for many years before, but, in fact, he hadn’t. Smith: He came all the way from California to introduce you that day. Stevens: I didn’t know that. Smith: He did. He came all the way from California, which again is one more bit of evidence, needless to say, just how much he valued your service and prided himself on his good judgment. Do you remember – was that just kind of a social conversation on the golf course. Stevens: Oh, for the most part, yes. I don’t remember the details other than we had a good time together. And I know that on the last hole I sank a long curling putt to tie the score in our match. We were opponents, actually. We rode together in the cart, but in the foursome we were opponents. We had a good time. Smith: Was that the last time you had any real contact with him? Smith: Let me ask you one other thing, because, again I trust you’ll let me know if I’m treading on thin ice here. I ask it in the context of his influence, real or imagined. I don’t know if you’ve read Jeffrey Toobin’s book on the Court, but Toobin has a chapter on affirmative action. The President wrote in 1999 an Op Ed piece that appeared in the New York Times. Stevens: I think I read it. Smith: Which described the Michigan situation in very personal terms. The fact that his best friend had been a black football player/teammate, so on and so on. And it caused a good deal of stir, and some criticism as you might imagine. But anyway, the thing that struck me in the book, I think there was also some effort that grew out of it [the Op-Ed piece] to call attention to the service academies and how they dealt with these issues. Toobin cited this and attributed it as a factor, a least, in, for example, Justice O’Connor’s reconsideration of the issue. I’m not trying to pry, but I’m asking – do you take notice of things like that? Is something like that a factor? Stevens: I think what you’re more directly referring to is the fact that I think that I’ve been told that President Ford was influential in having the amicus brief prepared on behalf of the Armed Services. A brief that was written by Carter Phillips, if I remember correctly. It was a very strong brief and I think, although it doesn’t often work this way, I think it was an amicus brief that was very influential in the consideration of the case. So, whether it affected Justice O’Connor’s vote or not, I really don’t know. But just my general recollection of the case is that it did highlight an important aspect of the whole issue that we all paid special attention to. Smith: And your own views on affirmative action have evolved, haven’t they, over time? Or how would you describe it? Stevens: That’s probably a longer story than we have time for, but there are some awfully important distinctions that are not often focused on in talking about affirmative action generally. Smith: It’s a roving term, isn’t it? Stevens: It’s a roving term and there’s a vast difference between action to create remedies for past wrongs, on the one hand, and actions that you think will benefit society on the other hand. I think I may have been the first member on the Court to emphasize that particular distinction in the case arising out of, I think Michigan, if I’m not mistaken, involving school teachers. There is also a vast difference between affirmative action in connection with building highways and concrete blocks, on the one hand, and educating people on the other hand. These cases are not fungible. And so, what seems, sometimes seems to be changes in one’s views, actually is application of the same basic view to a very different situation. And so I’ll just leave it at that. Smith: That’s fine. Couple of quick things and I’ll let you go. When the President died, I guess the whole Court was in attendance –at the State funeral up at t he cathedral? Smith: You must have felt a particular closeness on that day. Stevens: I did. I flew up from Florida. I was in Florida then – to attend the services. Smith: And then, of course, earlier this year you were honored at the annual meeting of the Ford Foundation. Smith: What was the story of that? Stevens: They asked me to attend and, of course, I was honored to do that. I actually attended that in preference to an affair here at the Court, I don’t remember what it was. It was very gratifying to be invited to that event. Smith: Last thing. Apart from the unique and historic relationship that you had, just as someone who has been around this town a long time, how do you think people should remember Gerald Ford? Stevens: Oh, I think they should remember he was a really great president. A man with really good judgment and with the courage of his convictions. One thing I’ll brag about – I’m kind of proud of it. When he pardoned President Nixon, I was on the Seventh Circuit. I remember going to lunch with my colleagues and, of course, that was the topic of conversation. And with two exceptions, my colleagues were dead set against what was done. Bill Bauer and I, I can still remember, said, no, it makes an awful lot of sense in the long run, think about…In fact, people have said that that’s what cost Ford the election. I think that may have actually improved his status in the election because it made the country better, so much better off, to put this all behind us. That he may actually have not directly recognized the causal connection, but I think it actually enhanced his strength in the country. Smith: That’s fascinating because we’ll never know what the state of the country would have been if we’d spent two years with Richard Nixon on trial. Smith: You just can’t imagine. Stevens: I think it was a very important decision and one that was dead right. Smith: Well, on that note, I can’t thank you enough. This has been great. Stevens: I’ve enjoyed it very much.